A simple logo is now recognized throughout the golf world. 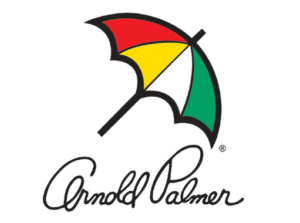 Have you heard of Arnold Palmer? If you’re a golfer or have watched golf a little bit you probably know him as one of the best golfers of all-time. If you’re not a golfer you still may have heard of him or maybe of the drink that’s named after him. Arnold Palmer is generally recognized as the man that brought golf to the masses. His peak was during the ’50s and ’60s. That was right when golf started getting play on TV and millions became part of Arnie’s Army. They watched on TV as Arnold played aggressively and went on charges to win tournaments. But Arnold Palmer was not only a great golfer. He was a savvy businessman. Heck, he still makes tens of millions each year. And I’d like to look at a few of the lessons we can draw from his success in life and in business. I read somewhere that one of Arnold’s strategies as his business career took off was that he was going to leverage his brand recognition in business and not his bank account. He looked for partnership opportunities. Someone with a business idea would come to him. The business would have the money and Arnold would bring the name and the audience of fans. This lowered the risk for Arnold and his ventures. I’m sure there were businesses that he was involved with in this way that didn’t go on to make millions and become huge successes. That’s inevitable in life and in business. With Arnold, he must have recognized this fact and it doesn’t appear that he ever put himself in a position where he could lose everything. Low risk. High reward. That’s a pretty good combination. And you can find those opportunities even if you’re not a name brand. What was Mark Zuckerberg’s risk for starting Facebook? Next to nothing. But the reward was incredibly high. Building on the last point is that it’s important to recognize your biggest asset or assets. For Arnold, that was him as a person. He was charismatic. He loved being around people. People loved being around him. They identified with him. He was the son of a golf superintendent, the person in charge of maintaining the course conditions. That’s blue collar. Arnold was good in business. I’m sure he had great ideas and contributed a lot to business, but I don’t think he tired to do everything. I think he recognized his own best abilities and those of others. Arnold was able to walk the line between selling things to people in all sectors of the market. He would endorse Cadillacs, but he would also ride his own tractor and endorse Pennzoil. But it always, and still does, seem like Arnold understands his place in the world. He understands who is audience is. And he respects them. That’s a subtle, but important business lesson. It’s not always easy. It’s easy to look inward in a business, but it’s always important to understand your customer and what they want, what they need, what they struggle with, what they enjoy, etc. Arnold seemed to endorse a lot of things. I remember watching a video somewhere recently where they were touring his office and museum. There were all kinds of advertisements for things that Arnold has endorsed. Some seemed kind of silly now, but it’s easy to look back and see that something maybe wasn’t the best venture. But we don’t have the benefit of seeing into the future. As a result, we have to try things and if it doesn’t work then figure out the next thing to try. I think we’re good at that as kids, but we lose it over time. We become afraid of failure and embarrassment. Arnold seemed to keep his zest for trying new things throughout his life both in golf and in business. Arnold is generally recognized as one of the most giving golfers ever. He is loved by so many fans and it has to be at least partly because of all the time and attention he gives people. He signs all kinds of autographs for all kinds of people. He writes notes to PGA Tour winners. He makes phone calls. Arnold knows that one of the keys to life is to give your time and attention to others without expecting anything in return. Arnold is recognized as bringing golf to the masses in the 1960s, but golf as an industry is much older. And Arnold always seemed to recognize and respect the history of the game. In fact, he took a bit of a risk early in his career by heading over to Europe to play in the British Open. Many Americans didn’t go to the event at the time because they would lose money even if they won the tournament. The purse wasn’t that large back then and the travel expenses were quite high. Arnold saw the challenge and he liked challenges, but he also recognized the importance of the British Open in his game and he wanted to honor that heritage. There was another video somewhere that I saw about Arnold. One of his now grown daughters was giving an interview and talking about her dad. She said that sometimes he still (in his 70s and 80s) to the driving range will hit some good shots and come out thinking that maybe he can still win a tournament on Tour. She kind of teared up thinking about it. Everybody knows that it’s not possible, but to Arnold it is very possible. He has never stopped competing in life. That’s a good lesson for anything in life whether it’s business or whatever. You have to maintain that drive. If you don’t, what’s the point? Arnold Palmer has won 7 major championships. Four Masters. Two British Opens. One US Open. If you know golf you know there are four major events. The one missing from Arnold’s history is the PGA Championship. He finished 2nd or tied for 2nd in the PGA three times. Certainly, but nobody looks back on Arnold’s career and thinks he’s a disappointment because he never won the PGA. That’s a small footnote in his history. I don’t believe he ever felt like his disappointment would define him. He never let it. Arnold Palmer was cool back in the ’60s. I guess he’s always been cool. Part of his appeal is that he always looks well dressed and he’s always shown good manners. He at least does that in public, but I’m sure he does it all the time out of habit. I’m guilty of it myself, but it’s important to dress for success. The way we look makes an impression, right or wrong, on others. We can either embrace that or ignore it. I always remember Arnold Palmer as a grandpa-like figure. My dad remembers him as a father-type figure. My grandfather sees him as a peer. I think each of us sees Arnold Palmer as being confident in himself. I don’t think it’s my own perception and that he only became confident as he aged. He believed he was a great golfer. He believed he was a great businessman. In life, you become what you believe. Arnold believed he would be successful and it came true. Some might look down on your confidence, but what does it matter what others think? Arnold Palmer defines the American Dream in a way. He had a dream. He was confident in his ability. He wasn’t afraid to try things. He became one of the best at his craft and also became successful in other areas of life including business. There’s a lot we can learn from looking at the way he’s lived. Certainly he’s not perfect, but his is a life to be admired.